As the year draws to an end, analysts prepare their predictions for US real estate in 2019. A report from Realtor.com points to a “tough year” on the horizon for buyers. Challenges include a shrinking inventory and rising prices. Other highlights of the year ahead include the implementation of the new tax plan, which favours renters (and therefore buy-to-let owners). Florida will see more price rises as well. 2017 set records for sales and price rises in US real estate. This year, the market has generally seen a slowdown in sales and more moderate price gains. 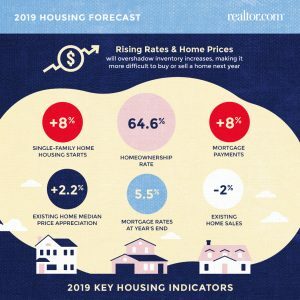 The 2019 National Housing Forecast believes these trends will continue in 2019. The Forecast predicts a drop of 2% in sales and a slight rise of 2.2% in prices. A major obstacle facing buyers throughout 2018 was lack of supply and this tendency shows no sign of going away during 2019. Realtor.com points out that there will be a slight rise in the number of homes on the market, but nowhere will availability be higher than 7%. “Don’t expect a buyer’s market on the horizon within the next five years,” says the report that paints a challenging picture for first-time buyers. The situation improves for more expensive US real estate in 2019. “The majority of new inventory is focused on mid to higher-end properties.” As a result, sales will drop next year across most of the country. As well as forecasting a 2% fall in sales and 2.2% rise in prices, Realtor.com also predicts an 8% increase in the number of new single-family homes. Homeownership will stand at 64.6% in 2019, a broadly similar rate to 2018. In terms of mortgages, millennials will account for 45% of all loans for US real estate in 2019 as older members of this generation become homeowners. Analysts believe 2020 will be the peak year for millennial home buying. Mortgages among baby boomers will account for 17% of the total. The new tax regulations introduced in 2018 by the Trump administration come into effect in April 2019. They include a higher standard deduction for tax payers living in rental accommodation. This means they will have lower tax bills, according to Realtor.com. The report points out that “without homeownership incentives, some renters are holding off buying”. This makes rentals more favourable and adds to buy-to-let potential for investors. As well as analysing US real estate in 2019 generally, the report also includes predictions for the country’s largest metros. In Florida, price rises will outpace those for the US as a whole. Some metros will see a drop in house sales. As has been the case throughout 2018, Florida property will continue to post higher than average price hikes. Property in Tampa stands out in the list as one of the markets with the highest price gains – 7% is predicted for 2019 (over triple the national average). North Port-Sarasota-Bradenton and Orlando are also expected to post higher rises with 6.2% and 5.4% on the cards respectively. Prices for property in Jacksonville are forecast to go up by 4.3% next year, almost double the US average.